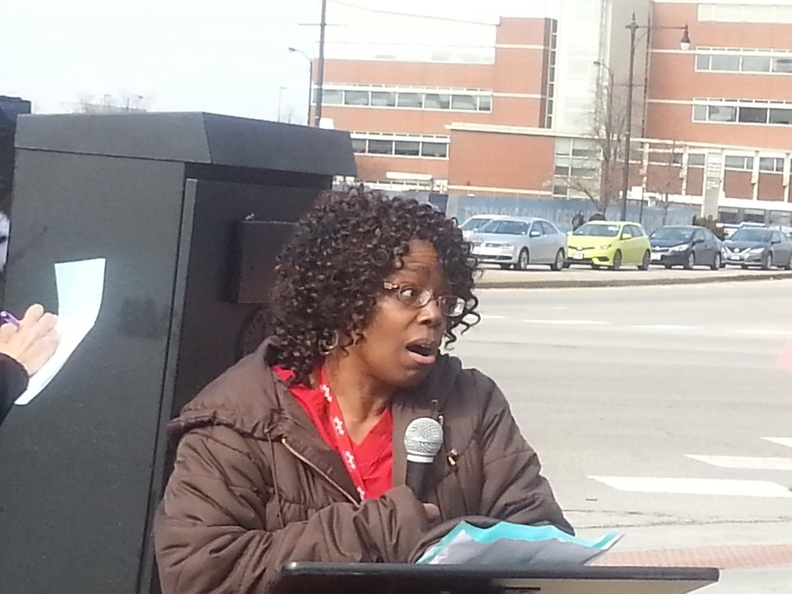 Joyce Robertson has been a public health nurse with the Cook County Health & Hospitals System in Chicago for 24 years. She says her labor union, National Nurses United, has repeatedly backed her up when her supervisors have retaliated against her for activism in protecting quality of care. Now she's worried about the outcome of a case being heard by the U.S. Supreme Court Monday that could have enormous ramifications for healthcare organizations. Janus v. AFSCME challenges the right of public-sector unions to collect mandatory fees, known as agency fees, from employees in the bargaining unit to represent them in contract negotiations. Twenty-two states allow such mandatory collections. Fees to cover a union's political activities already are optional under a previous Supreme Court ruling. Robertson says a ruling that takes away her union's right to collect those fees — which is expected from the high court's conservative majority — would seriously weaken the NNU local's ability to fight for the 1,400 nurses it represents and for the quality of care provided to the system's patients. Unions — which represented 7.9 million, or 34.4%, of public employees in 2017 compared with 8.5 million, or 10.7%, of employees in the private sector — are one of the strongest political forces advocating for protecting Medicare, Medicaid and other social programs. Overall, nearly 1.5 million workers in healthcare occupations are represented by unions, according to the U.S. Bureau of Labor Statistics. Administrators of public sector healthcare systems have mixed feelings about the Janus case, and public hospital systems in New York City, Los Angeles and San Francisco have filed amicus briefs supporting the unions' position. While some public system leaders might welcome seeing unions weakened by loss of fee revenue, others fear that would hurt public health efforts. They know that unions are the strongest advocates for maintaining funding for their agencies. "If Janus goes for the plaintiffs, I see a weakening of public service unions with them having less resources to work with us on patient care and the patient experience," said Dr. Mitchell Katz, CEO of NYC Health + Hospitals. "It will cause them to focus more on defending individual members over putting their time into the common good of how to improve the system." Alexandra Normington, a spokeswoman for the Cook County Health & Hospitals System, said that "regardless of the outcome of this case, we will continue to work collaboratively with our union partners to ensure the safe, high-quality and respectful provision of care to those we serve." There also are concerns about workplace conflict between union members and employees who choose not to pay union fees, potentially requiring management to step in. "There is potential for some people to be called scabs or freeloaders," warned Jon Anderson, a partner with Godfrey & Kahn in Madison, Wis., who represents hospitals and public agencies that deal with unions. "This makes it extra important for HR departments to be vigilant in making sure it's crystal clear to employees what their rights are and establish effective mechanisms for dealing with internal strife and harassment to maintain workplace harmony." The Janus case grows out of many years of efforts by conservative groups funded by the billionaire Koch brothers and others to weaken labor unions through overturning the Supreme Court's 1977 precedent upholding agency fees in Abood v. Detroit Board of Education. A previous case supported by these groups to eliminate public-sector unions' ability to require bargaining fee payments failed in 2016 when Justice Antonin Scalia died, leaving the court deadlocked 4-4. His replacement, Justice Neil Gorsuch, is widely expected to rule against the unions. Union supporters say the impact of the case would go far beyond the ability of unions to represent public sector workers on wages and work conditions. Sen. Bernie Sanders (I-Vt.), speaking Thursday at an NNU rally about the Janus case at Chicago's public Stroger Hospital, warned that the forces behind the Janus lawsuit are the same ones now pushing for big Medicare spending cuts following the corporate tax cuts recently passed by congressional Republicans. "The Koch brothers want to strip healthcare away from working people," Sanders said. "We need to defend and grow the trade union movement because they know unions are the last line of defense against their corporatist agenda." The Janus case was originally brought by Illinois Republican Gov. Bruce Rauner, who has made it a priority to roll back public-sector unions. After a judge removed him from the case for lack of legal standing, he was replaced as plaintiff by Illinois child support enforcement specialist Mark Janus. Janus argues that the First Amendment protects his right not to pay a $45 a month fee to the American Federal State County and Municipal Employees to represent him. He claims he disagreed with the union when it was bargaining with Illinois, feeling that the cash-strapped state needed to save money on salaries and health insurance. Those on the other side of the case say that's a misreading of the First Amendment and that interpreting it that way would hurt the ability of government units to manage their employees. "Hopefully it will be apparent to the court that if it embraces the extreme argument of the petitioner, it would hamstring the ability of governments to deal with their employees in a lot of contexts, such as regulating employee speech," said Amanda Shanor, a staff attorney at the American Civil Liberties Union, which filed an amicus brief supporting the unions' position. The Democratic Attorney General of Illinois, Lisa Madigan, is arguing against Janus' position. She and her colleagues claim the only relevant question is whether a restriction on an employee's speech affects the employee's ability "to speak as a citizen on a matter of public concern." Everyone agrees that a Supreme Court decision making payment of agency fees optional would seriously hurt public-sector unions financially, though the impact would vary by how strong a particular union's relationship is with bargaining unit members. It's expected that a significant percentage of workers would choose not to pay the agency fee, which can amount to $40 a month. "My guess is if you're paying $1,000 a year for something you don't want to pay for, you'll take whatever steps are necessary to get out from paying that," Anderson said. "People might think, 'The union is doing a phenomenal job but I need the money this month and my individual dues won't make any difference,' " Katz said. Union leaders say they've been preparing for this for several years given previous legal efforts by conservative groups to challenge mandatory agency fees. At National Nurses United, about one-third of whose national membership of 150,000 is in public-sector unions, the impact of an adverse ruling in Janus will be "minimal" because the union has been intensively organizing and educating members, who are "heavily invested in their union," said Fernando Losada, the national bargaining director. He's more worried about the wider national impact. "We're very concerned about what it will do to unions in general," he said. "If union power is weakened, it could have a negative impact on patient care. This is part of a much broader agenda by the corporate extreme right to undermine not just unions but the public sector." An adverse ruling for unions also could weaken their hand in contract negotiations by making it obvious to employers how much employee support the union actually has. "If only 50 people out of 100 in the unit are paying dues, that's not a real strong union situation," Anderson said. "That may influence the positions the employer takes at the bargaining table." If the high court rules for Janus, employers will have to make adjustments in their collective bargaining contract language and payroll processes to ensure that employee payments for union agency fees are no longer automatically deducted from paychecks. "I don't think public employers are asking for this change," Anderson said. "It's a love-hate relationship with unions. Some employers will try to exploit this, some may not. It depends on the culture of each bargaining relationship." Some legal observers hope the justices, who will issue a ruling by the end of June, follow a compromise suggestion made by two prominent law professors who filed an amicus brief proposing rules narrowing the use of agency fee revenue to cover only collective bargaining activities. That would leave room for states or Congress to pass laws to address the concerns of workers who have issues about how their union fees are being used without forcing unions to represent workers without payment. If, on the other hand, the court adopts the petitioner's argument completely, lawmakers would have no constitutional power to craft a middle-ground solution. Katz said he hopes the Supreme Court sees value in maintaining public-sector unions. "As an administrator, I know that being able to work productively with the union in tight organization with staff members focused on quality makes a huge difference," he said.